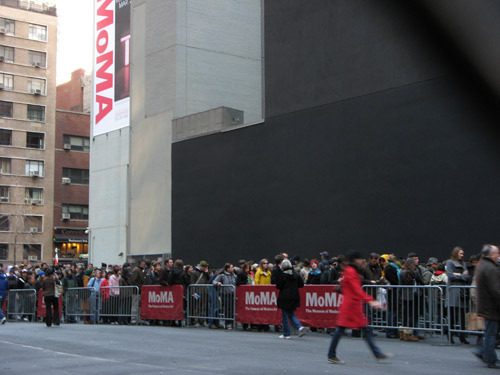 Since that first visit in January, we’ve been averaging a trip to Amazing 66 on Mott Street every couple of weeks. At the restaurant this Thursday afternoon, we had the serendipity to stumble upon the high-powered board meeting of new Asian American literary journal Kartika Review, i.e., our friends RL and SL. 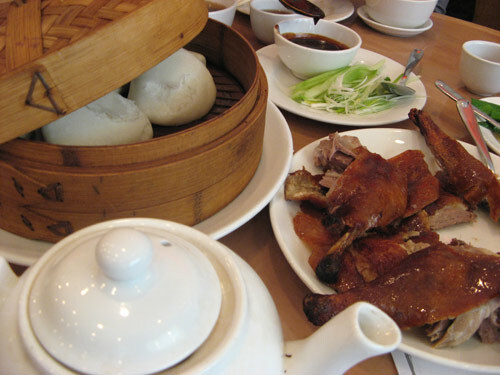 If there is any better way to conduct business than over a whole Peking duck, I do not know it. We joined them and their fellow editor DW at a large round table, where their meal was already in progress. Although the trio did generously offer to share with us some of their delicious-looking duck, I stayed strictly vegetarian with my #62 lunch special: Vermicelli with Buddha’s Delight. This slow-braised dish usually consists of a fairly long list of ingredients, cooked in a soy sauce-based liquid with other seasonings until tender. 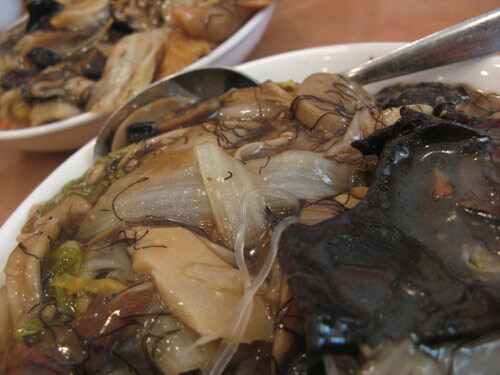 The specific items used vary greatly both in and outside Asia, and often carry some auspicious significance: black moss (fat choy) is a homonym for prosperity (as in “Gung Hay Fat Choy“); ginkgo biloba nuts (bak ko) mimic silver ingots and therefore also bring good fortune; fried tofu and beancurd sticks (foo jook) represent blessings to the house; bamboo piths (jook tseng), wood ear fungus (ha mok yi) and mung-bean threads (fun see) symbolize long life. No animals were harmed in the making of this delight. Is it still only Tuesday? 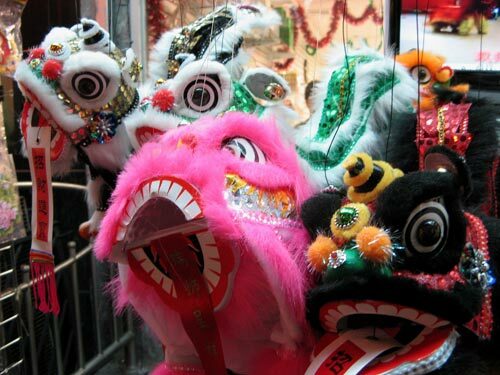 So far this week, there’s already been song and dance, thrilling victory and joyous celebration… and tonight, coinciding with Super Duper Tuesday and the traditional excess associated with Mardi Gras, our long-planned, pre-Chinese New Year feast at Chinatown’s Amazing 66. 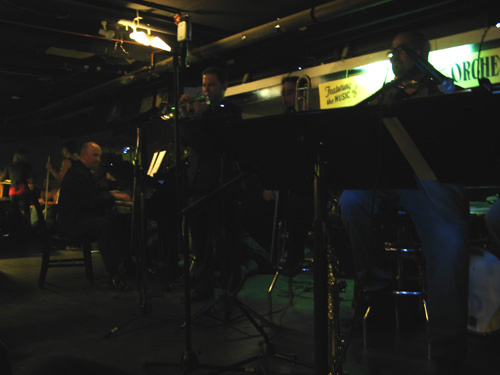 A dozen friends, new and old, gathered in the restaurant’s lower level. Early in, it was established that we would place ourselves (willingly, happily) in SL’s capable ordering hands, and just eat whatever food was placed before us this evening. So began the parade of deliciousness — off and on the menu. 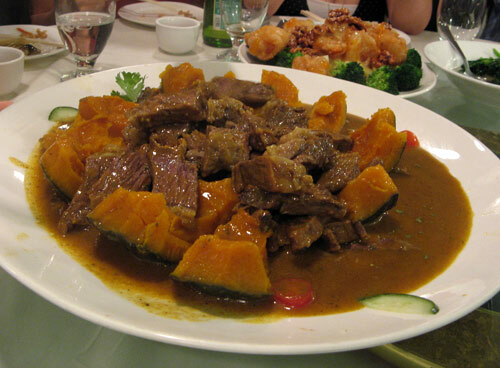 A platter of batter-fried seafood, sauteed pea shoots, pan-fried noodles with seafood, braised E-Fu noodles with black mushroom (for longevity), and this, the first of two restaurant specialties that required advance ordering: Short Rib Beef in a Pumpkin. Yes: that’s short rib beef! In a pumpkin! Was ever there more a delightful combination of words spoken? The dish was brought out to the table in one glorious piece, with chunks of steaming, lightly curry-spiced meat exploding tantalizingly out the top of the hollowed out squash. Our glossy-tressed waiter, brandishing a large chef’s knife, made quick work of the soft, pumpkin flesh before our eyes. 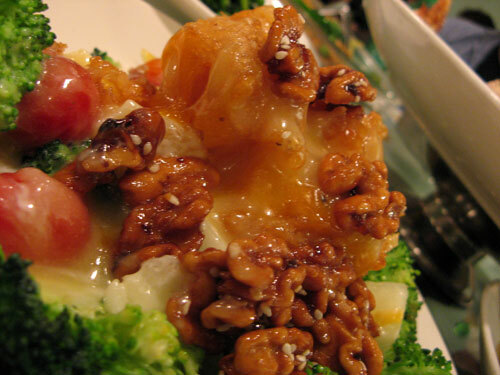 Salad Walnut Prawns — a classic dish made up of the seemingly strange combination of deep-fried jumbo prawns, slathered in a sweet mayonnaise, and laid over a bed of dressed mixed fruits, broccoli and candied walnuts. Tasty, though. 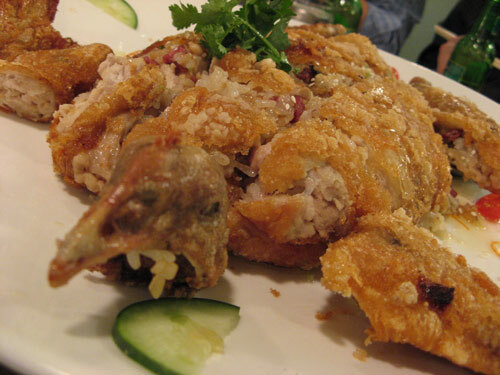 And the second show-stopper of the evening: the House Special Crispy Chicken Stuffed with Sticky Rice. Essentially, a whole chicken, deboned and de-…fleshed(? 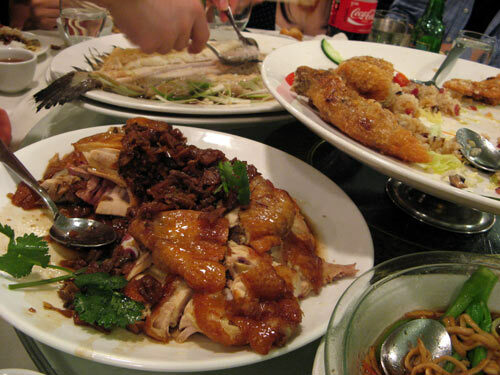 ), crammed with a combination of sausage-studded sticky rice, and then deep-fried and meticulously reassembled into the general shape a chicken, albeit a rather flat one. Head included, of course — to symbolize wholeness and togetherness. There were more dishes, selected for their symbolic auspiciousness: another chicken, roasted, and topped with preserved vegetables. A whole steamed flounder; the Chinese word for “fish” is a homonym for “abundance”. And an oyster casserole, to bring in “good things” for the coming year. We ate our fill — or perhaps just beyond — and finished with a round of orange wedges (for wealth) and bowls of red bean tong shui (sweet dessert soup). How a few of us still managed after all that to squeeze in a post-dinner trip to the Chinatown Ice Cream Factory can best be attributed to a new year’s miracle.